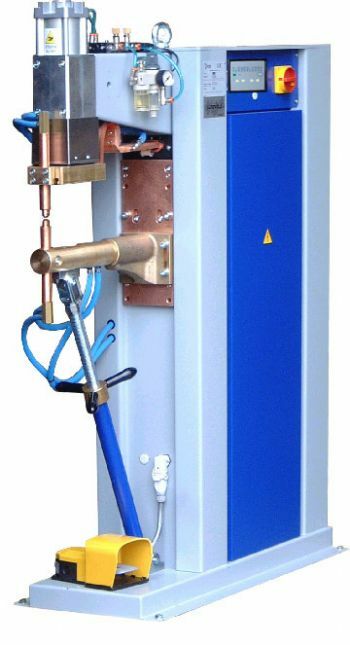 Versatile modern machines suitable for spot and projection welding. Ideal for weld nuts etc. Fitted with PX1600 Digital programmable control. Rigid top arm with cylinder acting directly on top platen / electrode holder ensuring linear movement and fast response. Lower arm adjustable for height and can be fitted with platen. Main transformer, arms and electrode holders are fully water cooled. All machines can be fitted with an adjustable High-Lift cylinder with manual or electric valve operation - useful for access over flanges etc. and for electrode replacement. Lower arm adjustable bracing strut.